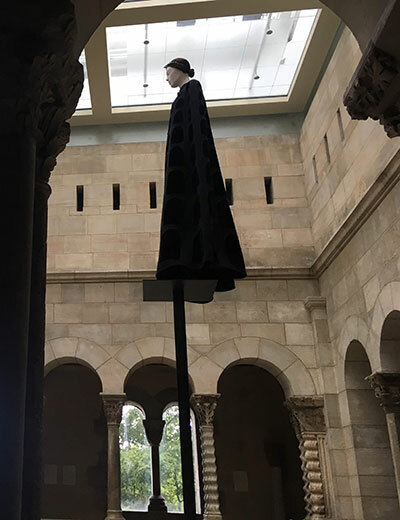 The ERA team took a trip last summer to explore the Met Cloister’s exhibit “Heavenly Bodies” in which dazzling fashion was seamlessly blended amongst medieval art and architecture. 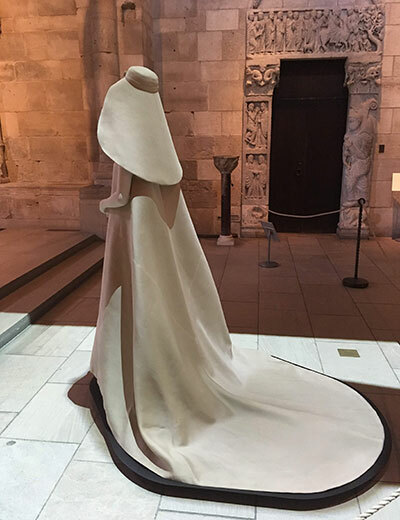 The connection between art and church of the medieval era was exaggerated with the addition of fashion from major houses including Balenciaga, Chanel, Dior, Valentino and Schiaparelli. A few of the rooms really caught our eye, with the placement of the garments and incredible attention to details. 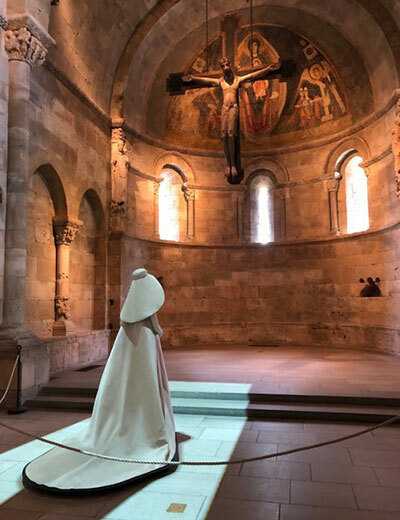 In one of the first rooms, the Fuentidueña Chapel, a lone figure in a simple white wedding gown from Balenciaga was the central focus. 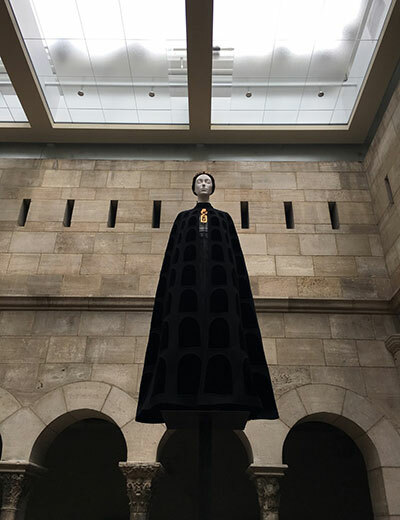 What made this room so compelling was the juxtaposition of this white dress in the dark Romanesque style room. 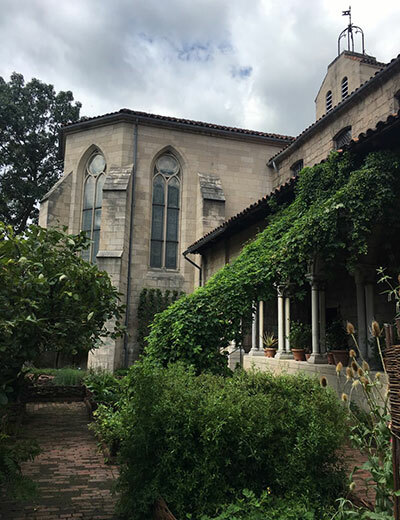 The Romanesque style of architecture known for the use of semi circled arches and reflects a design approach that uses darkness as a function of style. The veil and train mimics the arches of the surrounding windows. 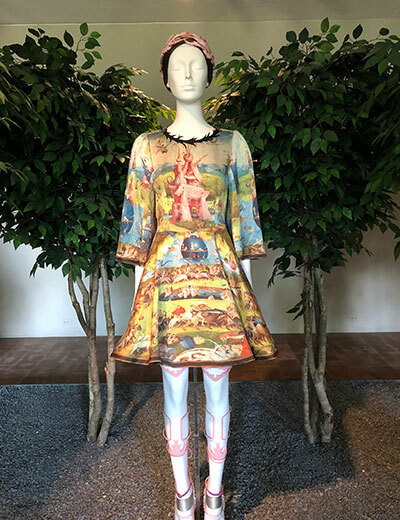 Later on we saw a dress and cape by Valentino, which draws inspiration from the Colosseum in Rome and depicts these arches as an all over print. 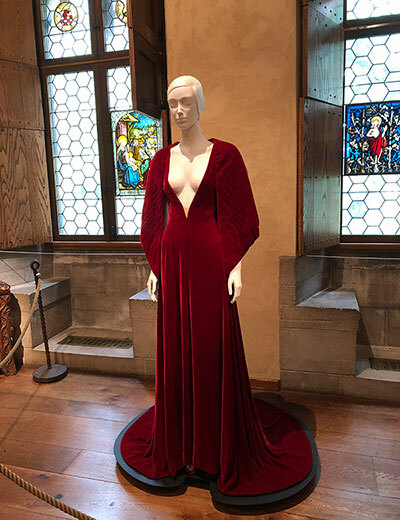 In another room, a beautiful red dress by Valentino stood alongside “The Annunciation” which illustrates the Virgin Mary in a red robe. The wooden shutters of the window were open, showcasing the stained glass windows. 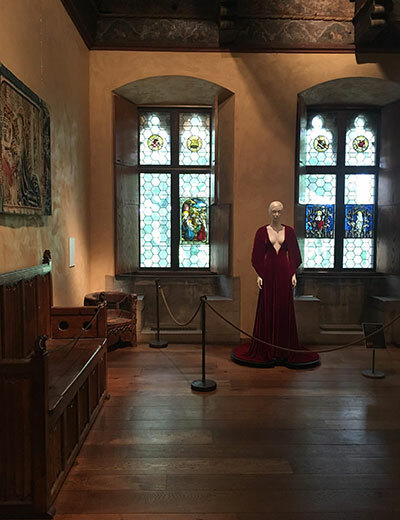 The red robes of the figures on the stained glass were accentuated with the red dress in the forefront. 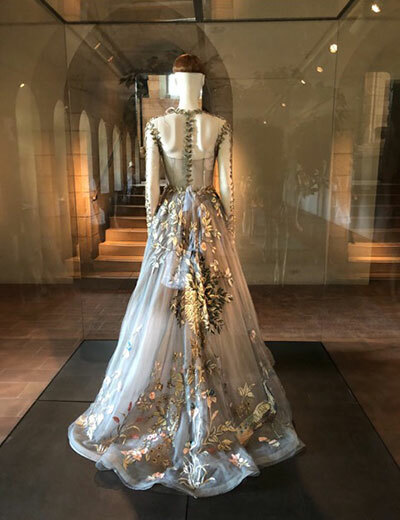 The dress also features embroidered arm details to look like an angel’s wing. Our last stop was a walk through the medieval gardens. 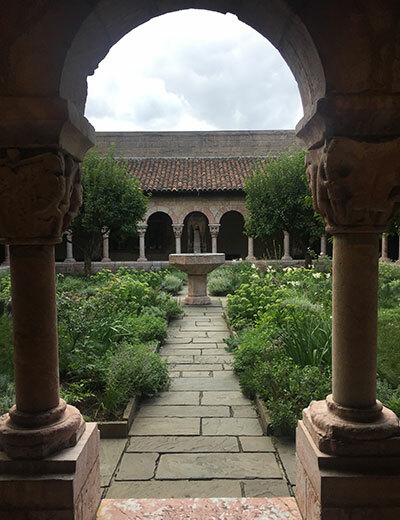 The Cloisters Museum is home to three traditionally medieval modeled gardens. Not only are these gardens aesthetically beautiful, but they would have been critical to daily medieval life. Every plant, herb and spice served a function of use ranging from beer making to fabric dyes. 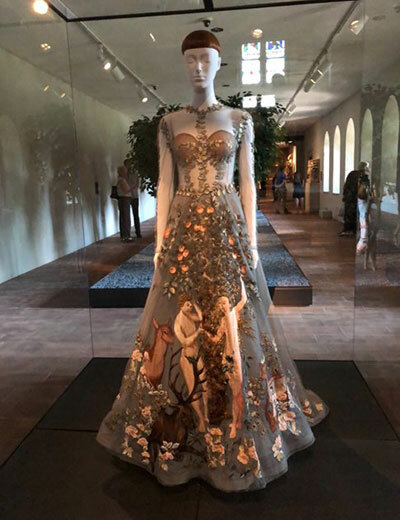 The importance of the garden was captured by the designs of Valentino’s Garden of Eden inspired dress and wheat dress in a nearby room. As well as Jun Takahashi for Undercover’s take on Hieronymous Bosch’s triptych The Garden of Earthly Delights. 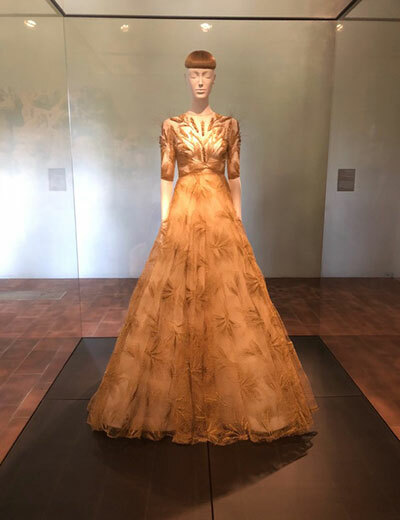 It is clear that the curator’s of this heavenly exhibit put incredible thought and care in placement of the fashion to reflect the art and architecture surrounding it. To see an example of how we use art and architecture as an influence in our design approach, explore our Woolworth Residences Model Apartment and see how ERA was inspired by the terra cotta window frames of the iconic “Cathedral in the sky”.